‘Joseph Beuys, conclusive proof not everyone is an artist’, according to a 2002 banner by English artists Bob and Roberta Smith. The gag is doubleedged—is it because he is such a bad artist or because he is so good that he makes it obvious how far others fall short?—evoking the intense ambivalence that Beuys still provokes nearly 20 years after his death. His shamanic pretensions strike many as a kitschy and regressive cult of personality while others succumb to the emotional power of his symbolic ritual actions. Are his political ruminations on ‘direct democracy&rsqursquo; nebulous and unworkable—as gnarly as Ezra Pound’s economics—or do they represent a model for artistic intervention in everyday life? More than with most artists, such questions about how to judge the artist’s underlying stance impinge forcefully on the reception of his objects: are they the emperor’s new felt suit or imbued with talismanic force? The exhibition at the Tate Modern, subtitled Actions, Vitrines, Environments, is probably not going to change any passionately-held views on such matters, but anyone coming to it still undecided will have a deeper appreciation for one of the most complex and challenging oeuvres of the past half-century. A good introduction to it would have been a visit to the small show of work by Lucio Fontana, Alberto Burri and Piero Manzoni that happened to be taking place one floor up. Without the example of the daring and poetic employment of all kinds of everyday materials and gestures by those Italian artists od the 50s, Beuys might not have been able to do what he did starting in the 60s— but how much more radical and expansive was his use of such materials and gestures. The first room in the Beuys show was occupied by ‘Fonds VII/2’ 1967/84, comprising eight huge piles of brown felt topped by sheets of shiny copper. Even without knowing that the artist spoke of works like this as ‘batteries’, one might intuit that the downward pressure of the thin piece of metal on those fleshy layers of fabric embody a sort of holding-in, a sense of immense potential energy within something seemingly static. 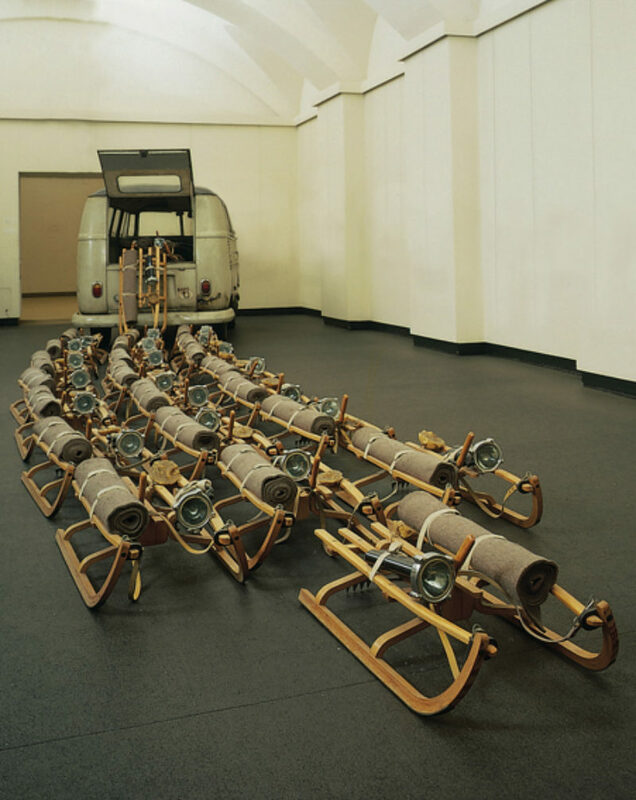 It is just this sense of stored potential energy that is typical of all of Beuys’s objects and installations. This may sometimes be expressed too literally, as in ‘I Want to See My Mountains’ 1950–71, with its dependence on inscribed ‘captions’ to enforce an emblematic reading of the wardrobe, rifle and other objects that make up the stageset- like room. A work like ‘Show Your Wound’ 1974–75, achieves its impact precisely by eschewing such hectoring: everything in this work of pairs is blank, expectant, in suspense, from the blackboards to the empty dissecting tables. Often Beuys relied on the simplest gestures of placement or rudimentary marking to induct an object into his work—likewise the unceremonious gathering of them into the simple display form of the vitrine. At times one senses that in doing so Beuys is attributing almost supernatural power to his own artistic hand but the fact is that, for all its ramifications, his pursuit of the concept of artistic activity amounts to a profound immersion in the implications of the workings of touch and the meaning of contact.